Its going so slow, I hope it gets done in time. I went to the shop the other day and they had the engine all painted and detailed and just waiting for the carb to come back. I cannot wait to hear it run, they said it sounded awsome and when they peeked inside everything looked new just like the guy who sold it to me said. The shop is suposed to start the assembly this week. OMG, can you believe my hubby walked in their shop to see if they could work on our other car, he looked all around at all of their projects and never even picked up on the TA on the rotisorie. They were freakin' and just kinda blew by it with him. This surprise is going so well, my daughters 4 and 5 have no uttered a word of this project for 6 months to anyone, no one can believe it. Hubby wanted this boat and I said OK but that is deffinatly your whole b-day gift and he was tickled and I know he will not be expecting anything. I found a banquet facility that will let me bring the car in and have it there when he walks in.... Surprise! A friend of ours that has been with his woman for 10 years now let him think they were going to get married and he will assume that we are going to their wedding. For some reason it is not letting me post any pics. Went to the shop today and there has been a ton of progress. The engine and drive train, cooling system, and all of the suspention is in. I decided to go with an all new interior and that came in today along with all the decals. It all looked excellent except they accidentally sent the vinyl seats instead of the Hobnail cloth ones I wanted, but they will exchange them. I will start posting pics and see if I can get it to work this time. Hey if anyone knows someone that may be interested in my car, let me know. This is pretty much the only website it has been on and I am in no rush to sell. I just picked up some pro-touring f-body solid body mount bushings...sweet! The car handles great with the factory WS6 setup and the 17x9's so I imagine that the solid body mounts should help cure some chassis flex...original rubber bushings always look like hell when you take them out. $9,500 takes her home. well the party went great and hubby was so surprised. I have a million pics and will post them with a link, it was so cool. He was in such shock he couldn't even talk just stare at the car. I will post a few pics of the car right before they finished the sanding and decals. 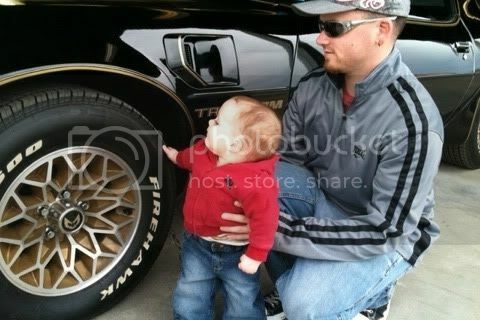 Check out the wheels, they turned out so good. That one sweet ride enjoy. Sorry, I stopped checking the website awhile back because my for sale thread got a little crazy. I will get you those pics if you're still interested? Sold...buyer is picking up the car next weekend. CONGRATS. Took some time but it sold. Thanks! A family friend really likes the car so I gave him a good deal to keep it around (it's my high school car). I'm swapping the headlights, turn signals, and rims with my other '79 so he can have a stock appering '79 T/A. I'll make a project thread for the other car so everyone can see that build. Old post but does anyone know how I can retrieve old pics that were once here?